I have stumbled across numerology and found out that there is such thing as life path number. The Life Path is the sum of the birth date of an individual. This number represents who you are at birth and the native traits that you will carry with you through life. The Life Path describes the nature of this journey through life. This is a number that is derived from all the numbers in your birth date. The Life Path number is established from the date of birth. First, convert the month to a single number, then add this individual digit, the birthday, and the individual digits of the birth year. The individual digits are again added together, as necessary to reduce the sum to a single digit 1 through 9, or to the numerology “master numbers,” 11 or 22. These master numbers are not reduced any further. 1) For example my date of birth: April 28, 1995 (4-28-1995). 3) In this case, add 4+2+8+1+9+9+5 = 38. Keep adding till you get a number from 1-9, 11, 22 or 33. 4) So, add the digits in 38, i.e., 3+8 = 11. 5) Hence in this case, the life path number is 11. Out of curiosity I calculated mine and then I read descriptions of my life path on the internet. I was very surprised because the descriptions could not be more accurate. I encourage everyone to calculate their life path number, it can be very helpful and it can give you clarity about your purpose in life. The numerology number eleven is one of the special numbers known as a master number. As a master number this number vibrates at a higher frequency than other numbers. As such, there is a great deal of power that comes with this master number. 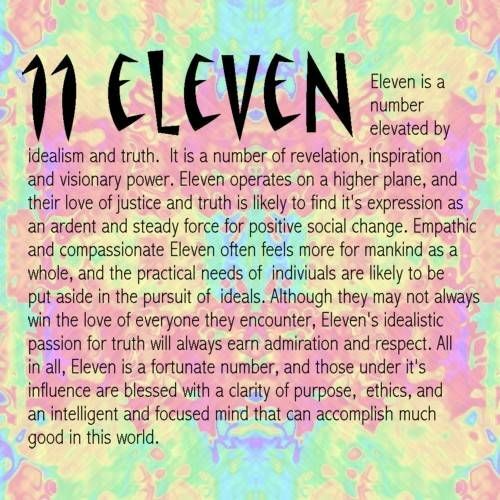 In numerology, the number eleven is known for their strong sensitivity and empathic ability along with a high level of intuitive perception. These individuals are here to inspire others and they usually do this by offering the information and messages that their guides, higher self, and inner voice provides. They are here to uplift humanity, and that’s a very difficult role to fulfill, but one which brings with it a great deal of both external and internal reward. As one of the two master numbers, the 11 yields understanding and knowledge beyond the grasp of others. People born with the life path number 11 are spiritually illuminated individuals who possess spiritual knowledge much beyond the reach of another average mortal. They are a source of inspiration for many. They are people who are often misunderstood in life and have to face the wrath of the world. Number 11 people are true visionaries whose ideas and concepts are accepted and idealized not instantly but over a gradual period of time. The Master Numbers possess huge potential. They are highly charged, difficult to deal with and require time, maturity and great effort to integrate into one’s personality. Master Number 11 people are very powerful, and have volunteered to incarnate to help the human race. Thus, people born with the life path number 11 are visionaries who are extremely enthusiastic about their dreams and ambitions. They are people with a spiritual high, loved and respected by many. Though they can be misunderstood and put down, their enthusiasm makes sure that their dreams are fulfilled, if not instantly but at least later in their life. The attitude toward life of those possessing this Life Path is somewhat extreme; extremely intuitive, avant-garde, idealistic, visionary, and cultured. These extremes make you an interesting, if unusual person, with much to offer society. The Life Path 11 person is deep-thinking, and you are no doubt interested in understanding many of life’s mysteries and more intriguing facets. Your inventive mind and broad-minded views will permit you to succeed in life in any number of ventures. You can best serve society, however, in those endeavors utilizing your skills of counseling and guidance. Much of your idealism is people oriented and quite humanitarian in nature. You expect a great deal of yourself and of those to whom you are close. Being at such a high vibration is very difficult. The 11/2 walks the fine line between greatness and self destruction. This number can be given over to fear and phobias or soar to the heights of the enlightened. The master number eleven is associated with being hyper-critical of one’s own situations and talents. Self-expectations are high in this number and those who are ruled by number eleven would do well to learn to make those self expectations a little more realistic. When expectations are realistic and can be achieved there is little worry that the numerology number eleven will fall prey to self destruction. Individuals with a birth chart containing numerology number eleven should also try to be careful with their planning skills. When there are no plans for the future, no direction to go, these individuals can become overly frustrated and begin to lose confidence. It’s not unusual for truly lost number elevens to find themselves sinking into the despair of depression. Another weak point that numerology number eleven is associated with the need to be cautious with diet and the nervous system. This is especially true when a person has the eleven life path. Even without the number appearing in the life path, the typical number eleven has a very sensitive physical body that needs a great deal of nourishment in both the form of food and in the form of physical affection. Having a balanced diet is a necessity; otherwise the nervous system can get out of whack. A person who is ruled by numerology number eleven, as a spiritual messenger, does tend to have a strongly intuitive mind. They can be very psychic. The number eleven must learn when to offer their insights and when to ethically keep those insights to themselves. After all, as hard as it is to believe, not everyone wants help and, in fact, most people would rather wallow in their own self pity as opposed to do something about their problems. The job of master number eleven, the spiritual messenger, is to pass along information and insights, but not worry about if others choose to act on the information. In order for master number eleven to make the most of its power the person wielding it will need to focus a great deal on self mastery and perfecting their talents, skills, and abilities. Like the one, there is natural leadership ability, and like the two there is a need to find and bring balance to others.